Port Townsend, July 5th. I did not receive GPS tracking information from the m/v A Whale today, and there has virtually been no news on the major networks. Video of the July 4th test has been made available by the US Coast Guard. Look carefully and you can see a tug tethered to a skimming boom is attached to the bow of the m/v A Whale, apparently to help funnel oil into the intake slots. I am really up to "here" with the mendacious stories spun by the neoconservatives surrounding this vessel. Everything from Obama was hiding the ship, Obama didn't want to upset the merchant marine, Obama wouldn't relax the Jones Act, and so forth. And I hold The Great American News Machine as being culpable in misleading the general public, and not asking HARD questions as to HOW this vessel is to be operated. * The insistence that this vessel is "dubbed" A Whale. "Dubbed" comes from the word "dub" which is what a King would do to a Knight, when he touched his sword to his shoulder. Therefore, "dubbed" means "give a name to." The fact is, the motor vessel A Whale, was designed and built in 1997, as the motor vessel A Whale. She was not dubbed A Whale. * Some reporters insist the oil will be suctioned or vacuumed off the surface into her interior for processing in various tanks. This is patently false. There is no suction or vacuum mechanism for drawing oil-laden water from the Gulf. The water simply flows through the series of slots cut in the hull, as the vessel advances through the water. * Some media, and a lot of bloggers and forum chatters talk about the millions of dollars spent in preparing the ship for her current duties. I find no evidence of this. In fact, a simple time line supports my premise that this was a sudden brainchild of Mr. Su to sell the concept to a frantic BP. * Next she is photographed high out of the water - no cargo - in Rio on the 15th of March. * Deepwater blew on the 21st of April. It wasn't until the beginning of May that the full ramifications of disaster became apparent. 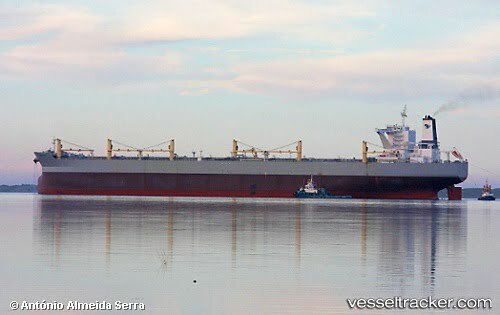 * Assuming Mr. Su woke up one morning in early May realizing he had an empty OBO sitting in Rio awaiting loading ore at Vale, he gathered his design team together to figure out HOW to convert the m/v A Whale to an oil skimmer. It has never been done before, but faced with a ship costing him close to $70,000 a day in wages and overhead, wouldn't you take the gamble? * Even IF Mr. Su decided the day after the Deepwater blew up, his decision to immediately modify his vessel as an oil skimmer would make no sense at all. Nobody had any idea until the end of April that there was a big time emergency in the Gulf. * So now let's assume Mr. Sue decided on May 1st that he can cash in on this disaster by putting his new OBO to work as a skimmer. He had TWO WEEKS to figure out HOW to modify the vessel, find a YARD with a space opening, and SEND his vessel to that yard from Rio. * Space was found in Setabul, Portugal. Setabul is 4,240 nautical miles from Rio de Janeiro. 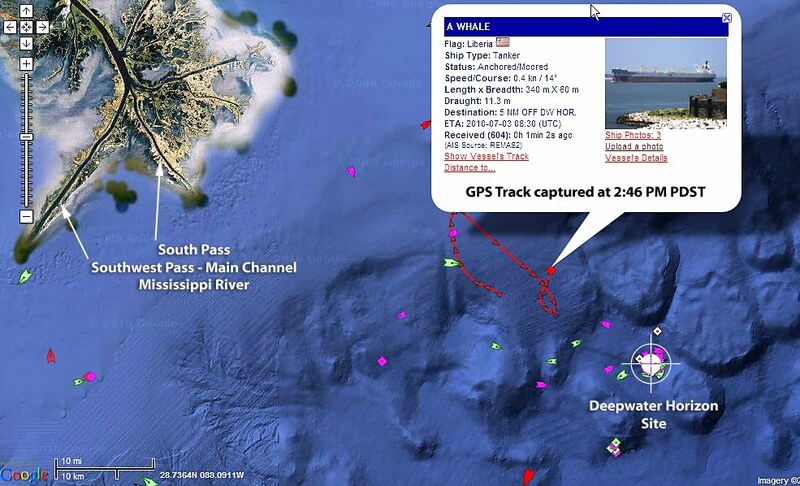 It took the m/v A Whale 14 days at 12 knots to arrive on June 2nd. The photo record is shown below. 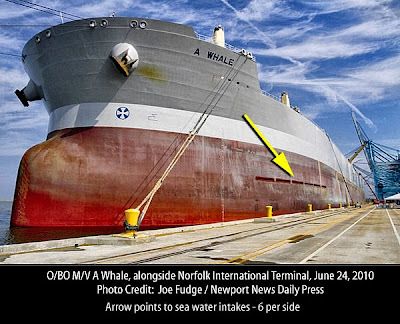 * We know the vessel next appears entering Norfolk on June 24th, as recorded in the photo record below. Back tracking, Newport is 3,064 nautical miles from Setabul. Again at 12 knots, that would be a 10-day voyage, meaning she had to have departed Setabul on June 14th. 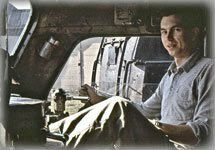 * That gave the yard in Setabul 10 days to cut the slots in the hull, install trash racks, and modify some plumbing and control system. * The point of this exercise is to demonstrate that this venture was hastily drawn up and glued together. 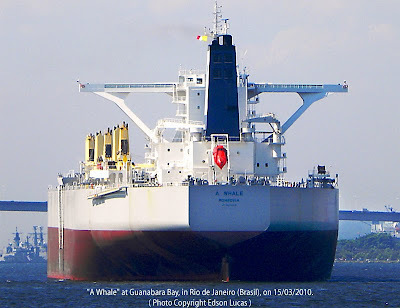 BP and the US Coast Guard were unaware of this happening, until the m/v A Whale arrived in Newport, to take on fuel, hire a PR spokesman, set up a big promotional event for the media, and issue notice to the world, "that the Calvary was on the way." 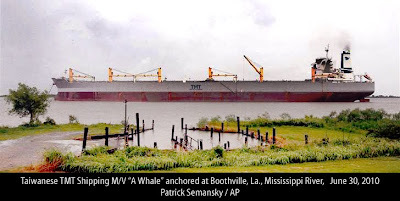 * The final leg, 1,500 miles from Norfolk to an anchorage on the Mississippi River at Boothville, Louisiana, took another 5 days, arriving on Thursday, July 1st. The first time BP, the US Coast Guard, anyone, had to see what she was and how she was supposed to operate. * Even at that, she did leave the anchorage to begin orientation and testing on July 3rd! * Finally, the slots are 198 feet apart (side to side.) As the vessel moves through the water, she cannot present a bow wave. The slots are too narrow. So she will literally drift along at less than 2 or 3 knots. At that speed, her rudder is virtually useless. So she will have to rely on her thrusters to keep any semblance of direction. * The GPS track I received from the first two tests showed a forward speed of 0.4 knots. Some speculate this allows her to skim approximately one square mile per day, which is about the same as one ship with the Dutch skimmer arms or five shrimp boats each with a reach of 40 feet. 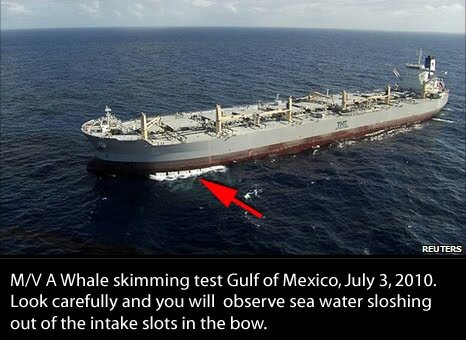 * Look at the size of the spill already, and figure for yourself how effective the "Whale" will be. That brings us up to date through Monday evening July 5th. Port Townsend, Sunday July 4th. For the second day, the motor vessel A Whale is conducting an oil skimming test in the Gulf of Mexico. From what I've been able to learn, test results from yesterday and today will not be made available until tomorrow. One can only wonder how really effective this effort will be when considering the size of the slots cut in the hull as compared to the ocean they sit in. How wide a path is being picked up, at what speed. Those slots are only 18" high; so how does the skipper know where the slots are, when he's perched in a wheel house 1,000 feet away, 8 stories in the air? The "press" is doing an abysmal job in addressing these issues. I think they are spaced out by the size of this vessel, and hype from TMT. So how did the M/V A Whale end up on the Mississippi River this past week, looking for a job as an oil skimmer? 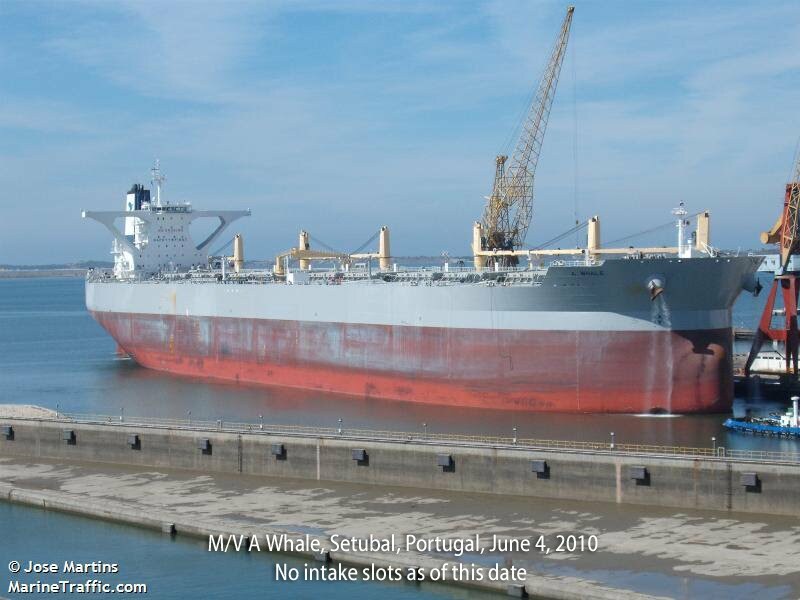 The M/V A Whale was designed and built as a Very Large Crude Carrier, and rebuilt at the end of 2009 as an OBO oil / bulk ore carrier, not as an oil skimmer. The M/V A Whale was originally built by Hyundai Heavy Industries Co Ltd., Ulsan, South Korea, in 2010. International Maritime Organization Number IMO 9424209. She is 1,115 feet long, 196 feet beam, and 60-foot draft, single screw diesel powered, with a design speed of 15 knots. She's also referred to as "Capeship" because at almost 200 feet wide, she is too wide to transit neither the Suez Canal nor the Panama Canal, having to transit either Cape of Good Hope or Cape Horn for inter-ocean travel. As the halcyon days of tanker traffic diminishes, daily operating costs skyrocket. This vessel gobbles up about $70k/day in crew wages -36 - and overhead expenses. Many tankers are now built to transport both liquid cargo and bulk cargo. 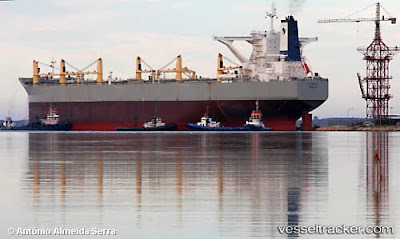 These vessels are referred to as OBO - Oil / Bulk Ore carriers. 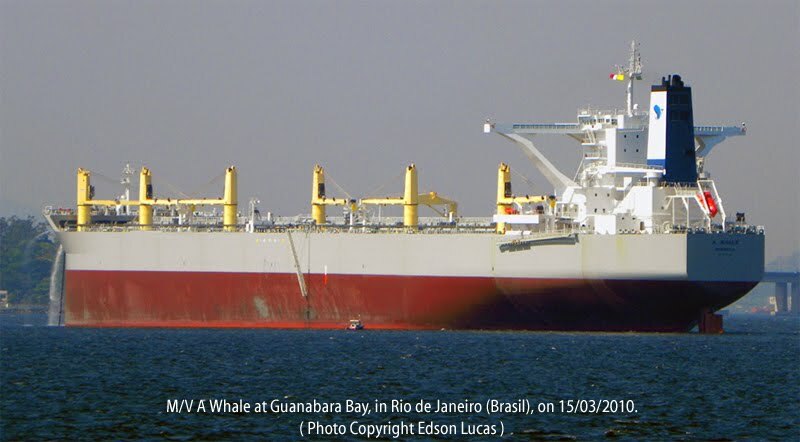 This allows the vessel to "back haul" bulk cargo such as ore, grains, cement, following a delivery of crude or other liquid product, primarily in the South American - Middle Eastern - European trade. Today Makes Tomorrow. Mr. Ching Wun Su who pioneered as a banana boat operator with inter-Asia routes established TMT in 1958. At the time the company was appropriately named Taiwan Marine Transport, which bears the same TMT acronym as the current company name, Today Makes Tomorrow. Mr. Su's son Nobu is the current CEO. This OBO, one of 5 - A, B, C, D, and E Whale are operated under the name Great Elephant Corporation, headquartered in London. 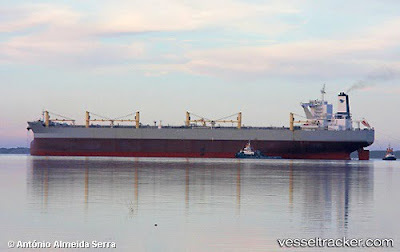 Once the decision was made by Mr. Nobu Su to create a "Super Oil Skimmer" - strictly on speculation, she was sent Portugal. Here she is arriving at Setúbal, Portugal dockyards on June 2, 2010. Over the next two weeks, a series of 12 16-foot slots were cut in her bows, six per side, about 15 feet below the fully loaded Plimsoll Mark. 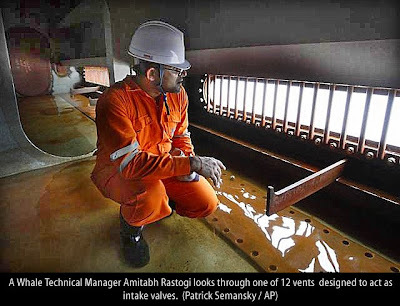 These slots, protected by trash racks to prevent the ingestion of logs, debris and large creatures, allow oil contaminated sea water to enter the vessel. Oil laden water passes through a series of internal tanks, (already in place when the vessel was originally built) where the oil is allowed to float to the surface of the water. 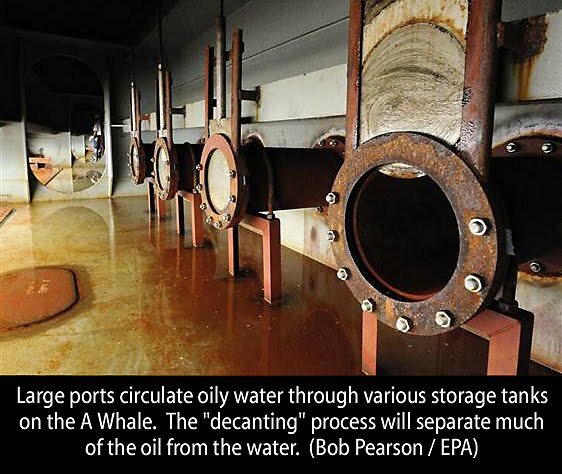 Thus separated from the oil, sea water is returned to the Gulf; the remaining tanks collect oil for transport to a shore side facility. Remember, the vessel was built as a tanker. I emphasize this once more, because the neoconservatives are already fabricating stories about this vessel. These tanks were already built into the vessel. During the 10-day retrofit in Setúbal, the physical slots, trash racks and control system was installed for the settling tanks. And the new logo, TMT - Today Makes Tomorrow was applied to her sides. 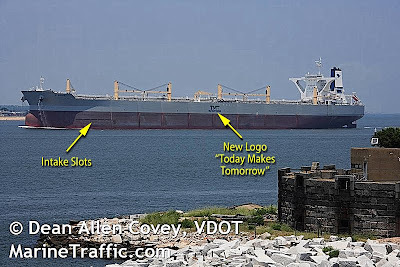 Photographer Dean Covey captured the M/V A Wale as she entered Hampton Roads, Virginia on June 24th. Now there is some "slight of hand" in the video. The complex control panel with all the lights and switches? That was originally installed on the vessel, which as remind you, was built as a tanker. But will it work? Quite apart from the operational challenges, much will depend on BP and TMT negotiating compensation. As I mentioned earlier, a vessel this size is expensive to operate, at about $70k/day overhead. 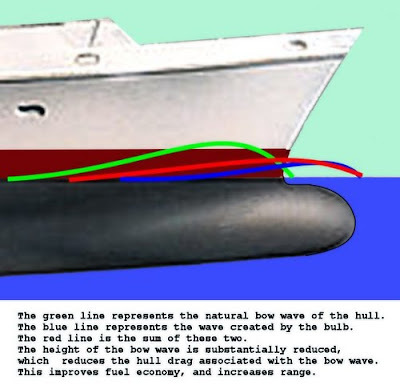 An OBO requires at least seven knots headway to maintain rudder control. How will the forward speed of the vessel affect the ability to intake though such narrow slots. Take another look at the size of the slots compared to the vessel. How will control be maintained to keep the intake slots at the water level? An OBO requires almost two miles to make an emergency stop. What will be the operating parameters in relationship to other vessels, platforms, and drill ships? As you look at this photo of the M/V A Whale conducting skimming tests in the Gulf, remember the SIZE of the slots. 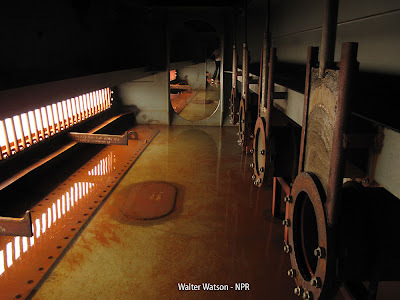 Ask yourself, how much oil laden sea water is actuality entering the collection chambers. Remember, there are NO suction pumps at work here, just the forward momentum of the vessel "skimming" the water. Only time will tell if the M/V A Whale will be the first in a successful fleet of Super Skimmers, or become TMT's CEO Nobu Su's "Great White Elephant? Terrific blog. I'll have to tell my rail friends about it. As of 7/6 1500 EDT I have heard nothing as to the effectiveness of the A Whale. I'm hopefulit proves itself worthy asset in the war against the spill. I wish it had arrived two months ago but even if it had I don't think it was a skimmer back then. [Recently Renergie, Inc. submitted unsolicited proposals to U.S. 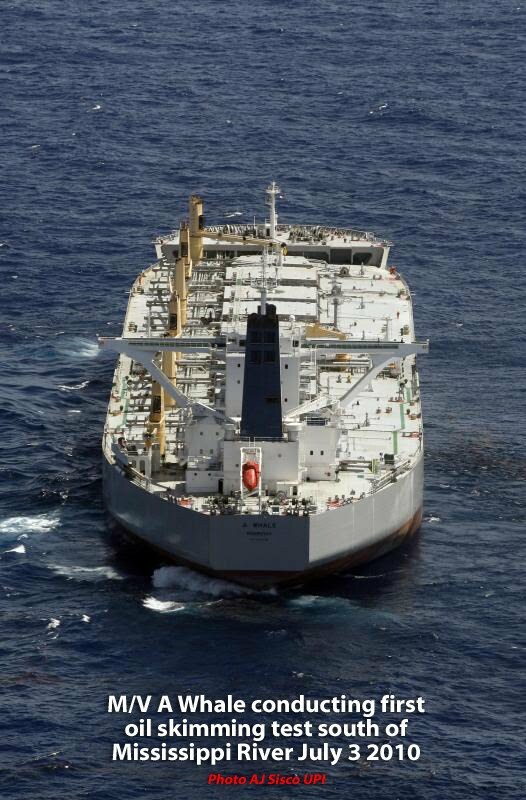 Senator Bill Nelson (D-FL), the Governor of Louisiana, and the USCG for the purpose of: (a) collecting the BP oil spill in the Gulf of Mexico with three Panamax crude tankers; (b) separating the oil and water onboard the tankers; and (c) transporting the separated crude oil to a shoreside facility. 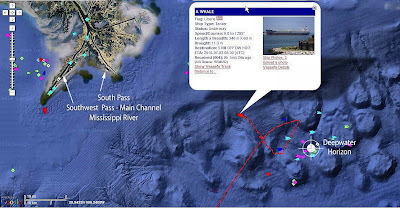 The three tankers employed by Renergie, Inc. would be capable of collecting 1,419,000 barrels of the BP oil spill; and, via a series of onboard skid-mounted three-stage oil/water separators, be able to separate a combined total of 432,000 barrels/day of the BP oil spill. To date, U.S. Senator Bill Nelson (D-FL) has not responded. The Office of the Governor of Louisiana forwarded Renergie’s proposal to BP and the USCG for their review. The Saudis have some experience with VLCC/Oil Recovery Vessels. They used them to recover a massive spill in the Persian Gulf. Where there's a will there's a way. If the A Whale can separate oil/water effectively, smaller, more maneuverable skimmers and/or vessels of opportunity can use booms to and sweep arms to funnel the oil into the A Whale while it remains in a stationary or semi-stationary position. Seabgb: Thank you for the compliments. Oil-Electric is primarly a railroad blog, but my interest in the Macando Blowout has side tracked more than one train! Number 1: You comment "The Saudis have some experience with VLCC/Oil Recovery Vessels. They used them to recover a massive spill in the Persian Gulf." seems to be absolutely groundless. Nickolas Pozzi, who made the talk show circuits with that fairy tale early on, has largely disappeared back from whence he emerged. "Saudi Aramco unequivocally refutes allegations about an alleged 'secret' oil spill during 1993 in the Arabian Gulf." The company states that "There is no factual basis to those allegations, and there was no such event or incident as alleged concerning its operations in 1993, 1994, or at any other time." Furthermore, the company said that while Pozzi was a former employee of the company he made no significant contribution to the spill preparedness or response teams during his employment or at any other time. "The claims made about his alleged efforts at a 1993 oil spill response operation are without factual basis," said Saudi Aramco. Number 2: The Renergie, Inc. story. I've found dozens of blogs repeating that story word for word. Real investigation of FACT taking place. It is TRUE. The US Coast Guard is NOT in the business of hiring contractors. That responsibility belongs to BP who OWNS this problem, NOT the taxpayers of the United States. Neoconservatives seem to want it both ways; "No!" to government spending and "Why isn't the government spending money whimsical projects." Renergie leaves out the part naming the tankers they want to modify. And they leave out the fact they have NO EXPERIENCE in managing VLCC's. In fact, the only evidence of "Renergie, Inc.," is a blog. "Renergie, Inc is a private company categorized under Ethyl Alcohol, Ethanol and located in Gainesville, FL. Our records show it was established in 2006 and incorporated in Florida. Current estimates show this company has an annual revenue of 420,000 and employs a staff of approximately 6." If someone came to me without bona fides, I'd probably ignore them as well. I had my doubts about Renergie from the start. But the Saudi VLCC/spill response claim was a little harder to put out of my mind. Some people seem quick to discount it flat out... 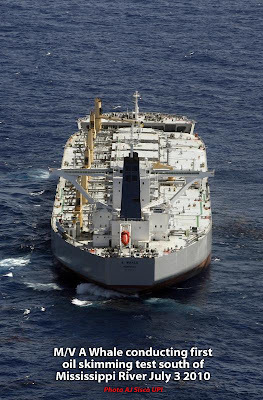 It's too hard to maneuver a VLCC; their bows would push the oil away; you would have seen the spill from space via satellite; the Saudis couldn't keep it a secret; why would they lie about it? etc., etc. I'm not so sure. For one thing, mention the Persian Gulf War spill to a lot of people and tell them maybe as much as 600,000,000 gallons and you get back blank stares. Not too many people remember the Gulf War Spill with any clarity. Is the Saudi VLCC/Oil Spill recovery thing real? Hmmm, probably not, but I do see the wisdom in Very Large Oil Spill Recovery Vessels with 50,000 and more barrel per day capacity. The Mighty Servant III (foreign-flagged) is no small thing in itself and is currently being utilized effectively. Meanwhile, what we have (US-flagged) is woefully inadequate. Also, I for one do not think BP has sole responsibility for cleaning up this spill. I do think they have sole responsibility for paying for it. My logic is that if I had a ten story factory go up in my town I would expect the taxes from that factory to pay for a new ladder truck and enough firefighting and hazmat assets to deal with anything that happens there. I would not expect nor would I want the owners and workers at that factory to protect me from an incident. They have a primary responder responsibility but when the real threat hits and things get out of control I expect the protection to come from my government... local, municipal, state and federal. I'm not a neoconservative but I expected more from this administration between day one and day twenty. At the very least, I expected a hands on approach and an explanation of assets mobilized here and abroad. People say there were no impediments to offshore resources and that the Jones Act cabotage laws did not slow the response down one minute. I find that incredibly hard to believe. I'm a professional mariner and I can say from personal experience that I have seen the Jones Act work first hand. I believe in the Jones Act, but in this case I felt it should have been temporarily suspended, even if it was just a matter of perception. Before the A Whale arrived the only substantial foreign-flag vessel working on oil spill recovery in the Gulf was the Mighty Servant III, which already had a Jones Act waiver. I know of no other substantial, offshore-capable foreign-flag vessel currently working ion the Gulf. Anyway, keep up the good work. Great site.